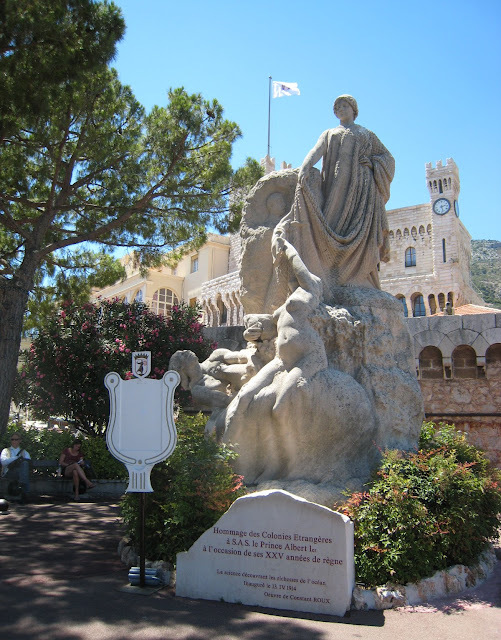 This statue, standing outside the Palais Princier on Le Rocher, was created in 1914 by Constant Roux in hommage to Prince Albert 1st of Monaco and to commemorate the 25th year of his reign. Albert I, an eminent scientist and seaman, was the creator of the magnificent Monaco Oceanographic Museum and also the Paris Oceanography Institute. 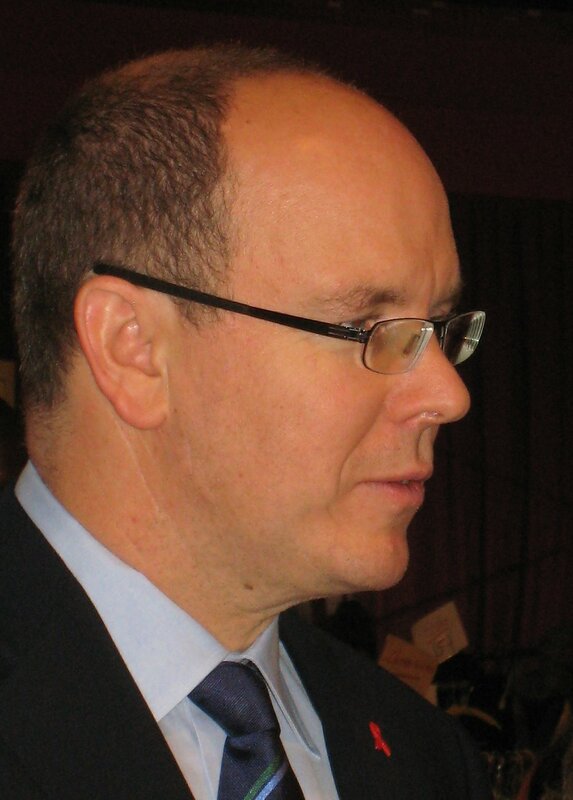 He was the great-grandfather of the current Prince of Monaco, Prince Albert II. This looks like it might have been in an old Chicago-style gangster movie, or perhaps Bonnie & Clyde - but I've probably got it all wrong. No idea what the make of this car is or how old. Am sure someone will help me. Fabrizio? It was outside a garage along with a Lincoln Continental. 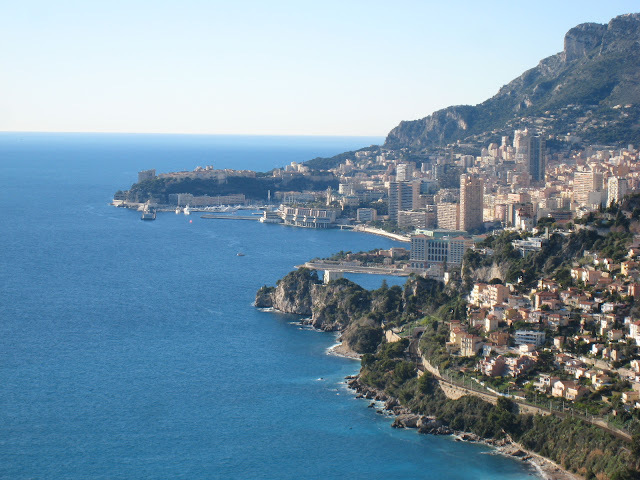 As soon as you go drive into the hills and away from Monaco, you'll get a different view of the Principality. 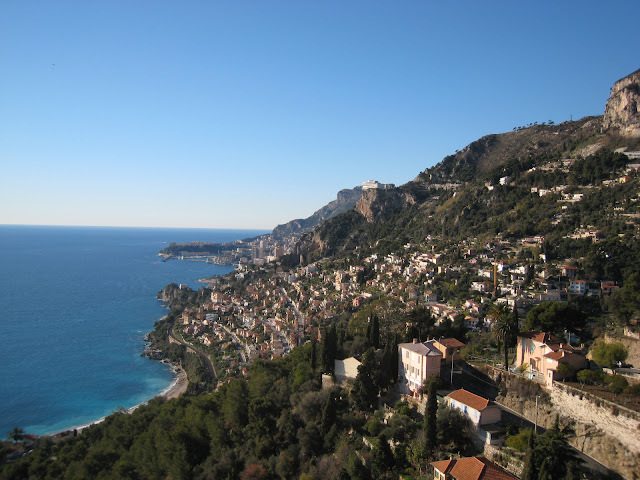 In this photograph, Monaco is in the distance and nearer you see the villas leading down to the beach in Roquebrune-cap-Martin. The paragliders jump off the mountains way up to the right and land on this beach below. This photograph was taken from the Place des Deux Frères in the medieval village of Roquebrune. If you click on the link, you'll be there! 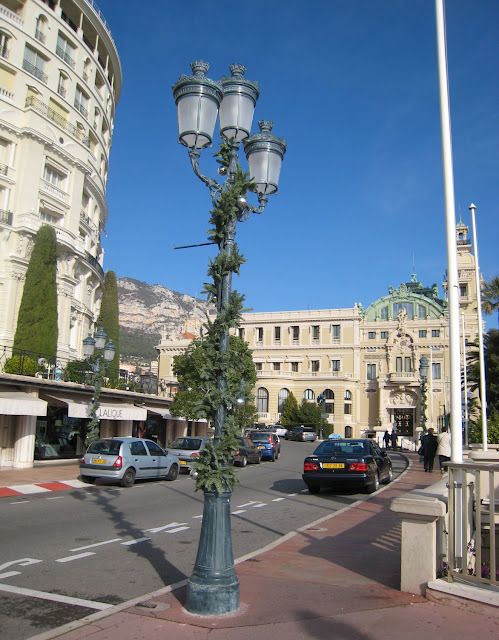 Lamppost decoration for Christmas. Quite subtle, I think you'll agree. You can see the side of the Casino building ahead - the beautiful doorway is the entrance to the Salle Garnier which is the Opera house. The Hôtel de Paris is on the left and the main port of Monaco is below us, on the right. 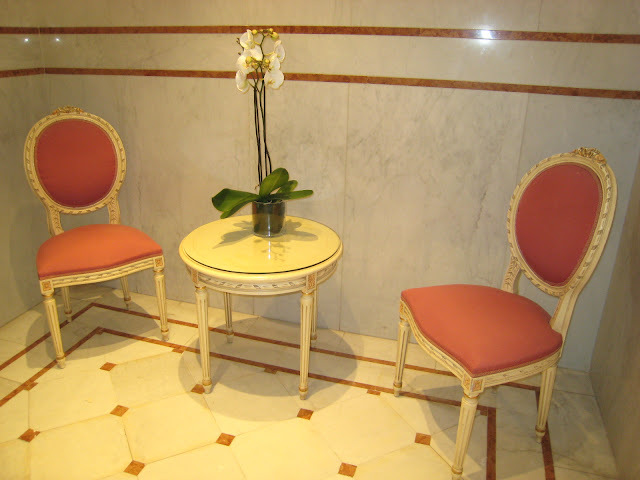 The Europa is a large, luxury apartment building on Boulevard des Moulins. 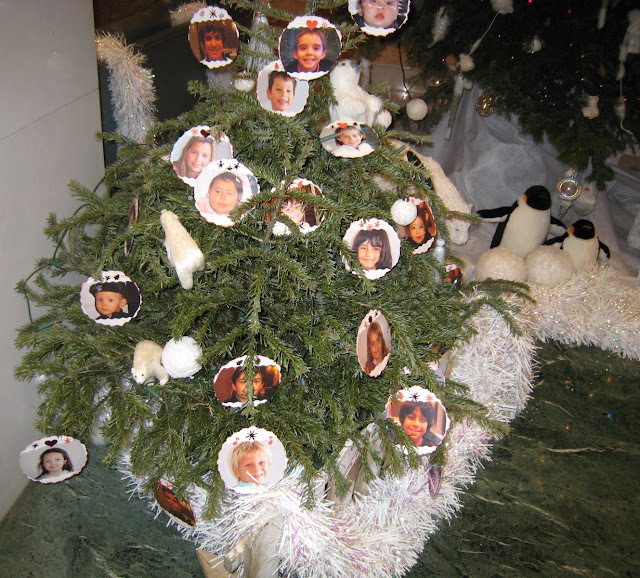 In the foyer is a large Christmas tree and at its base, two smaller trees, each hung with photographs of children - children who live in the building. Isn't that nice? Charlie Brown: Isn't there anybody who knows what Christmas is all about? Linus: "And there were in the same country shepherds abiding in the field, keeping watch over their flocks by night..." Charles Shultz. Happy Christmas everyone! 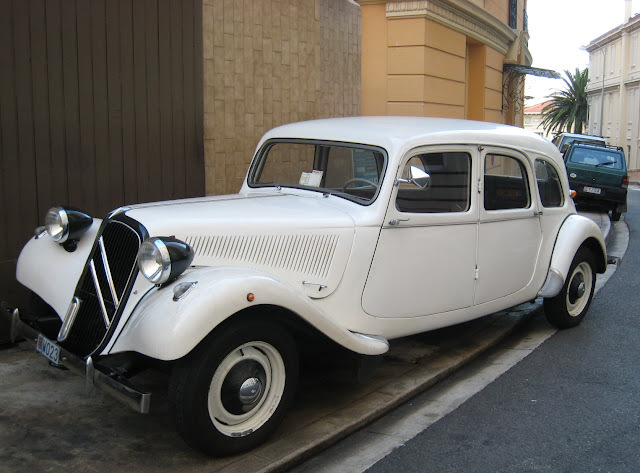 - and thank you so much - my esteemed fellow Daily City Photo bloggers - for visiting Monte Carlo DP and Menton DP - for your comments, your encouragement and help and most of all your friendship. 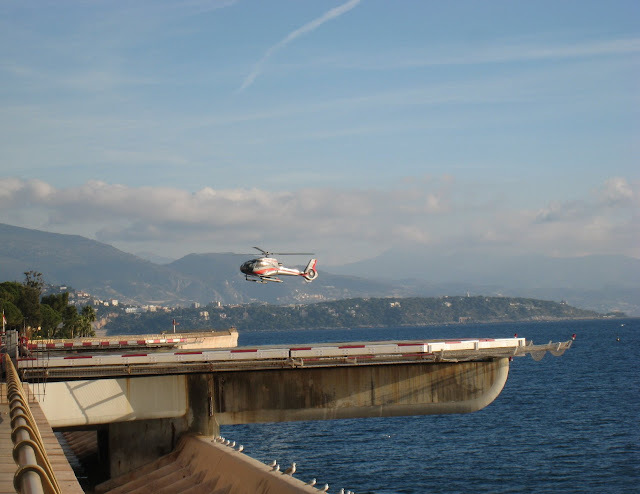 This will be a very busy area today, with helicopters ferrying passengers from Nice airport to the Heliport of Monaco in time for Christmas. You can see Cap Martin in the distance. Menton is beyond that. 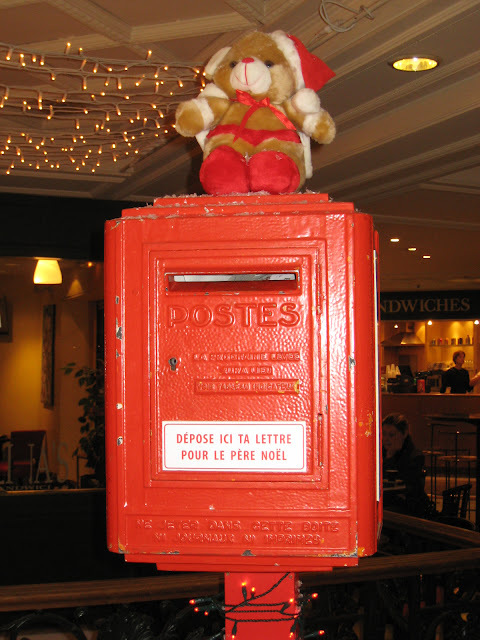 We're in the Metropole Shopping Centre near to the Casino. So many displays for a child to enjoy. Did you father ever take you somewhere special at Christmas? Lunch in the Casino gardens. I had to pop in to Monaco today and so took advantage of the trip and went shopping at Carrefour, the big supermarket, in Fontvieille. Carrefour is better - by far - than any supermarket that Menton has to offer. It's fun shopping here. The food is fabulous - so fresh, the service is great and anyway it's nice to look at all the beautiful people. It's amazing who you bump into as you walk down the aisles. Today, tho, they are offering an extra service. 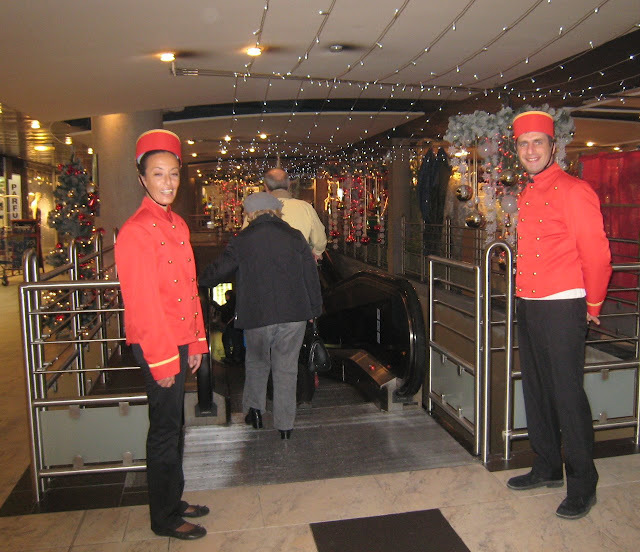 This is the escalator that goes down to the carpark and as you enter, with your fully laden trolley, these two friendly people, offer to come down with you and load up your car. Isn't that nice? I'm sorry the photo isn't very good. I took another looking back at this couple and they posed for me brilliantly but it's blurred. I'd got the wrong settings. Wrap on knuckles for Jilly. And did I take advantage of their offer? Well, no I didn't. I like to transfer stuff slowly to bags and boxes but it was nice to be asked. 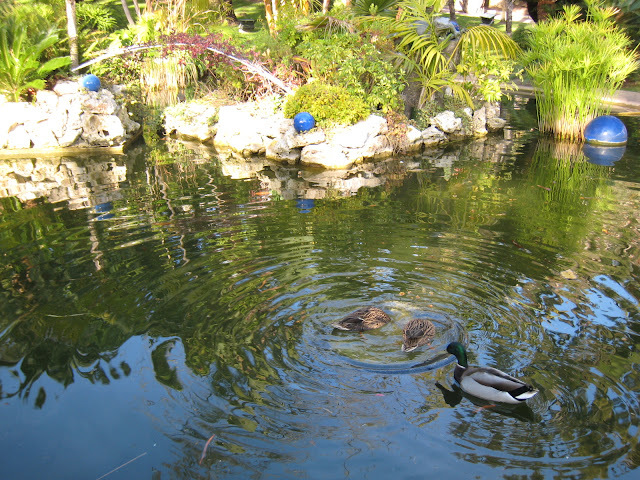 Don't know about you but I need a break from the commercialism of Christmas so here's the pond in the Casino gardens. I watched these three ducks waddle, very quickly, along the path - slip into the water and make a beeline for this central area. I 'think' a tyre is buried just below the surface of the water and presumably that's where the ducks are fed. They appear to be diving for food, don't they? Just off to the right, on the lowest level, is FNAC: the shop in France where you can get CDs, DVDs, books, all-things-computer, cameras, etc. I love it and when I visit, usually grab a coffee and a brioche sucré in the space you see below. Great people-watching place it is too. What do you like to drink and eat when you take a break from shopping? 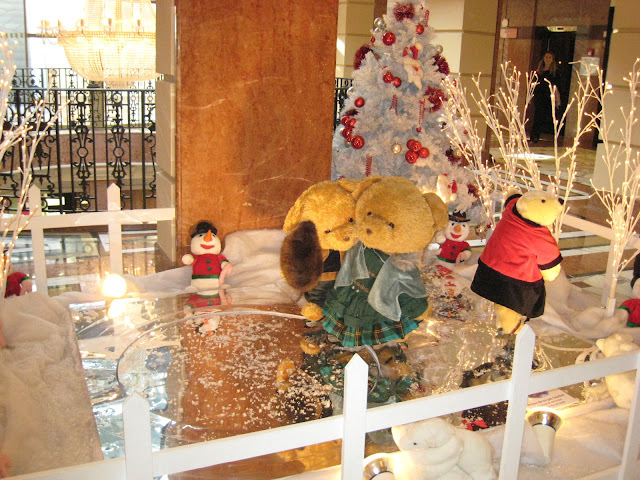 Looks like the Metropole shopping centre has a Christmas bear theme: a polar bear yesterday, today teddy bears. This display is at the entrance below the escalators that descend from the Casino gardens. Not easy to photograph because they are skating bears and as we know, skating bears not only go round and round in circles, but they spin at the same time...and very fast. Every time I clicked, I ended up with the back of a bear or a side view. Got it eventually. Happy skating! 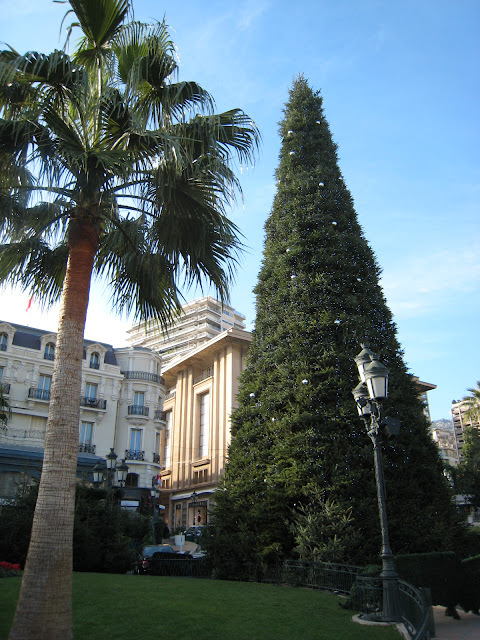 Well, you'd expect Monaco to do Christmas BIG - and it has. 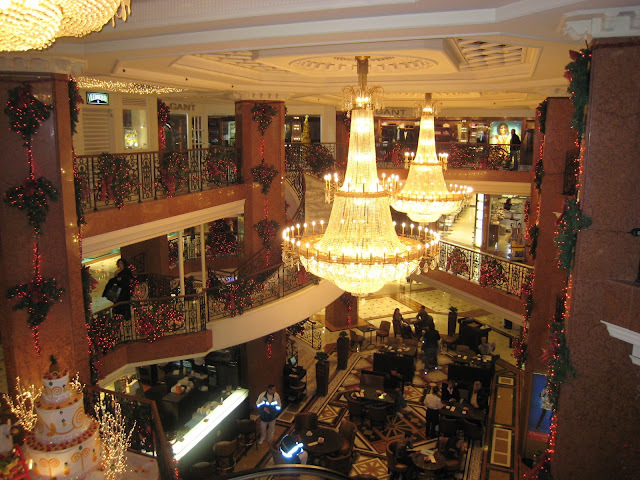 This is one end of one level of the luxurious Metropole shopping centre. This table is used by one of the restaurants. 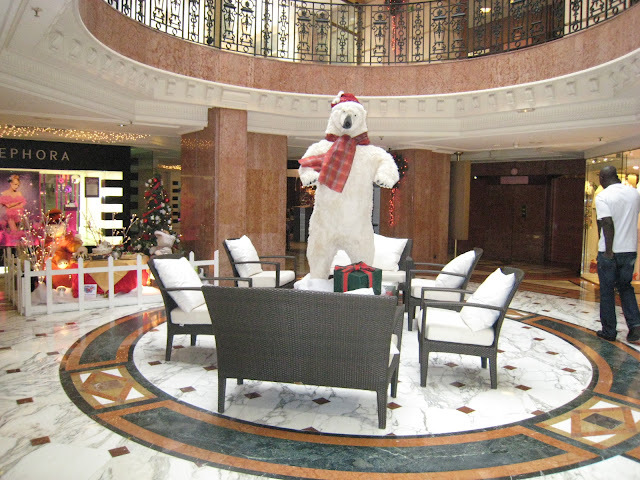 Quite fun to share a table with a polar bear! Of course my Monte Carlo ladies, aren't always ladies who live in Monaco. I would imagine this glamorous lady is a visitor to the Principality - and I hope that's not real fur! 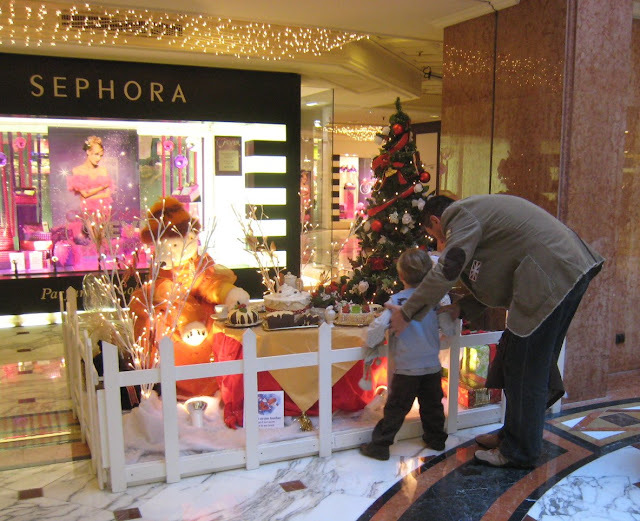 Here she is, with her man, looking in the VERY expensive jewellery shop next to the Café de Paris on Casino Square. This plant with amazing seeds is just outside the circus tent - to be exact, outside the toilets. 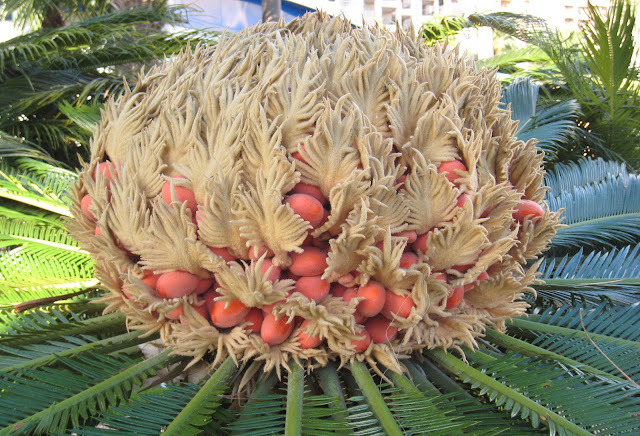 I think it's a female cycas revoluta but am sure someone will correct me if I'm wrong. I stepped onto the grass to take this photograph and got told off by an official. 'I'm only taking a photograph,' I said. 'Well you are not allowed on the grass' he said. 'Dogs go onto the grass,' I said. Okay, okay, so dogs can't read. 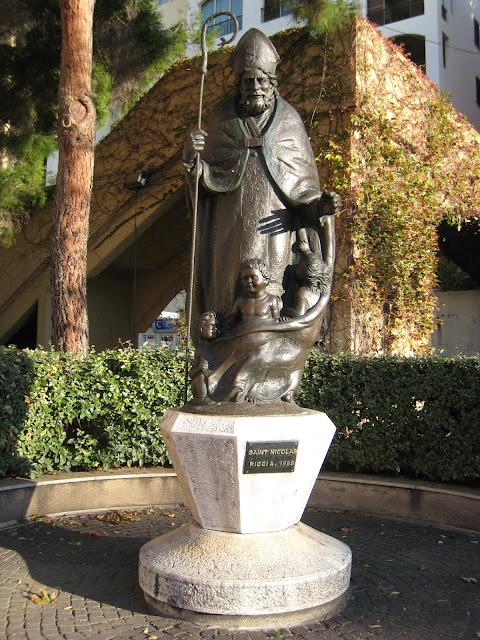 This sculpture of Saint Nicolas stands just alongside the church you saw yesterday. Saint Nicolas is said to be just about everyone's saint. He's named the patron saint of more causes than any other. In France, the most familiar story, both told and sung, is of three little children lured into the clutches of an evil butcher and rescued by Saint Nicolas. 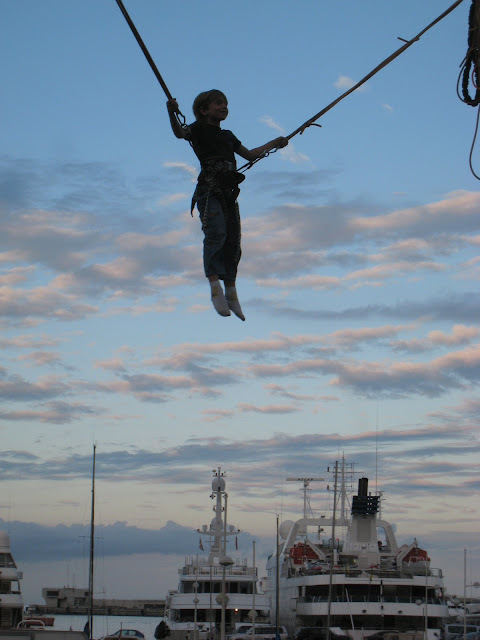 In other parts of the world, however, Saint Nicolas is mostly known as the patron saint of mariners. It seems the very first St. Nicolas was Greek and he became the Bishop of Myra which is mentioned in yesterday's posting. And of course what do we call Saint Nicolas these days? Why Santa Claus, of course! An early morning photograph so perhaps a little too much shadow? 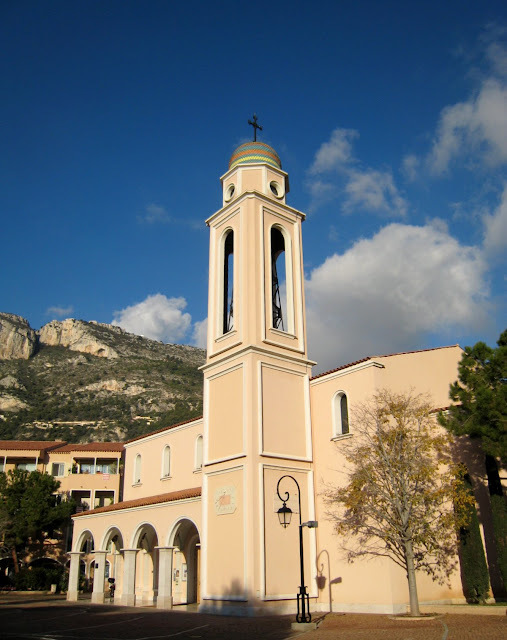 This lovely church at Place du Campanile Saint-Nicolas was built between 1987 - 1989 in Fontvieille - the area of Monaco reclaimed from the sea. Its dedication to St. Nicolas is taken from the ancient church on Le Rocher, which was razed in 1873 to make way for the Cathedral of Monaco. The baptistry comes from the earlier church. Although the exact date fo the construction of the first parish church cannot be traced in any archives, tradition leads us to believe that the church mention by Pope Innocent IV in December 1247, authorising the Genoese to build a chapel there, could well have been the first ever parish church. Such a church, placed under the patronage of Saint Nicholas of Myra was mentioned for the first time in 1322. 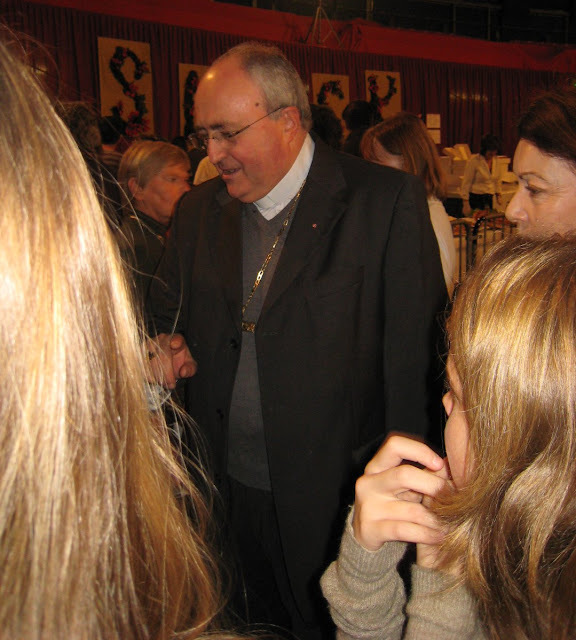 Yesterday you met the Archbishop of Monaco, today, meet the Scottish Chaplain of St. Paul's Anglican Church in Monaco talking to ladies on one of the British stands at the Kermesse. I promised you inexpensive food. Look at those prices. 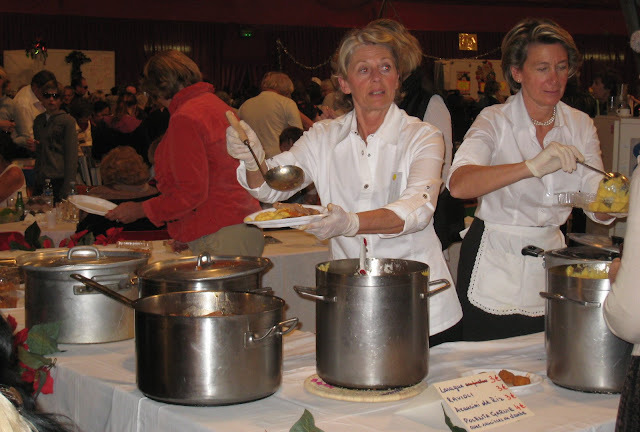 The food is all home-cooked and really good too. 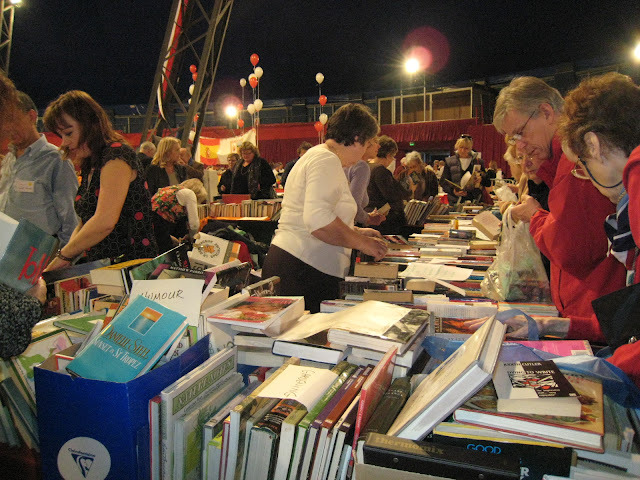 Books - certainly the reason I go to the Kermesse - apart from it being a great social get-together with friends. Amongst the many stalls are two selling books: one with books in French and the other - the larger stall - has books in English. At the English book stall, as soon as one book is sold, there is another to replace it. The hardbacks were 2 euros this year and the paperbacks were, I think, 1 euro. Many people arrive with a bag of books (this is a charity after all) hand them over and then proceed to buy more. You can see, behind the stall, one of the supports for the circus roof that you saw yesterday. Tomorrow I'll show you how inexpensive food can be in Monte Carlo. 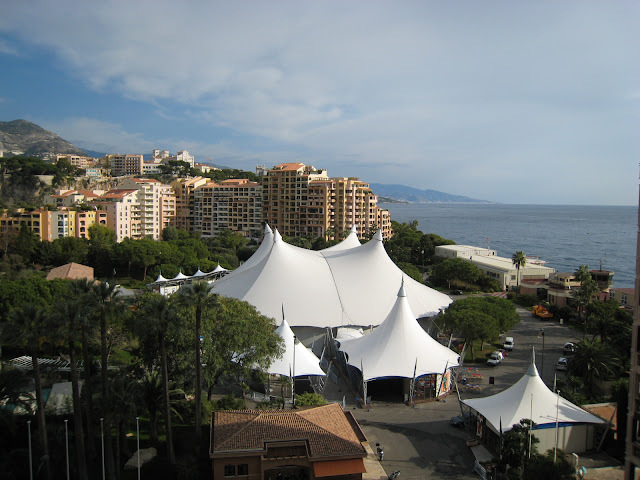 This is the Big Top in Fontvieille. The Kermesse is held here each year, as is the dog show, the world-renowned circus competition, of course and all the big fairs. 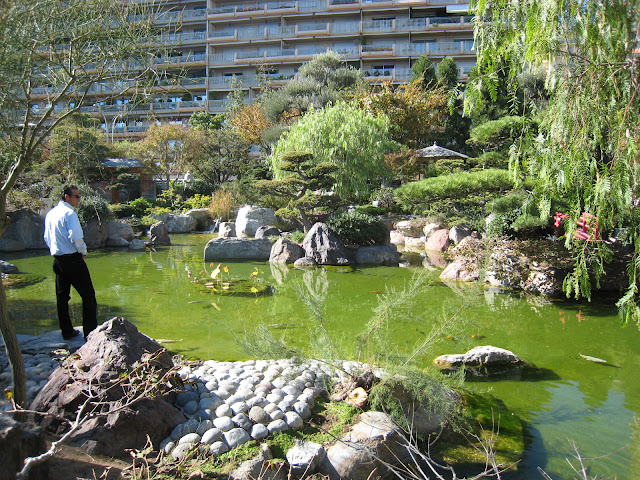 Fontvieille, which includes the apartment buildings you see, is built on land totally reclaimed from the sea. You can see the heliport - the flat white building. Menton and Italy are in the distance. Tomorrow, we'll go back inside. Here you see Prince Albert sitting down to paella with the various organisers of the Kermesse. Don't you love that here you see a Prince drinking out of a plastic cup and I'm pretty sure those bowls are plastic too. Personally, I have a lot of time for Prince Albert - his interests are sport, the environment, Aids charities and much more. He always has time for people. I watched him as he walked around the Kermesse, meeting and greeting people with time to spare and with real interest. The gentleman in the foreground is Colonel Lamblin. He used to be the late Prince Rainier's Chamberlain and stayed on for a while to help Prince Albert. Now he is retired but as you see is clearly delighted to be spending time with the Prince again. 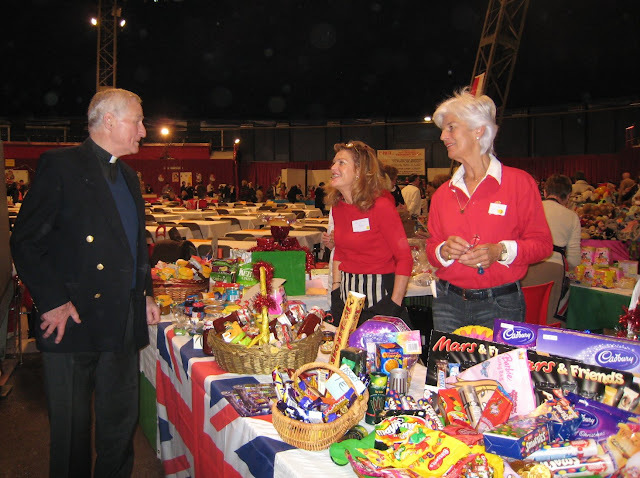 Each December, a Kermesse (charity bazaar) is held in the circus tent in Fontvieille. 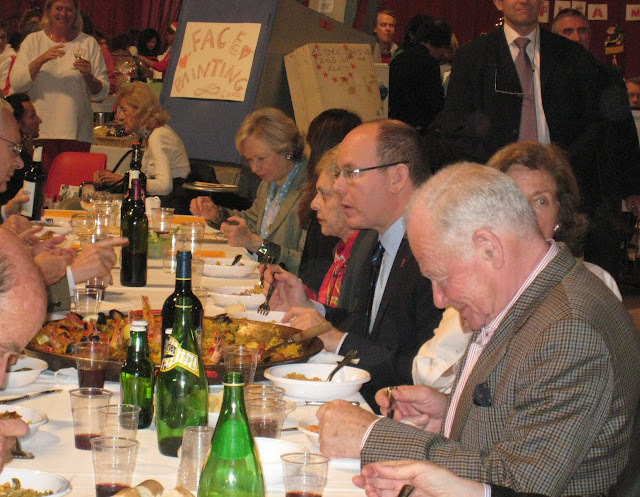 In aid of Saint Vincent de Paul, Saint Paul's Anglican Church, the Reform Church of Monaco, the British Association of Monaco, the Spanish community and the Greek Orthodox community, it's always a social occasion, particularly for the British community in Monaco. The circus tent is filled with stands selling old clothes (often designer clothes and you'd better believe it for 5 euros) - gifts for Christmas, English food for those that miss home, English books, French books - and later - lunch. We all stop for lunch (great food) and take over the tables that fill the centre of the tent. Prince Albert visited every stall, spoke to all the participants, posed for endless photographs and then sat down and had lunch. Come back tomorrow and I'll show you what he ate and after that we'll take a look around the Kermesse - see what's for sale and meet a few people. Yesterday was World Aids Day and you'll see Prince Albert is wearing the badge. 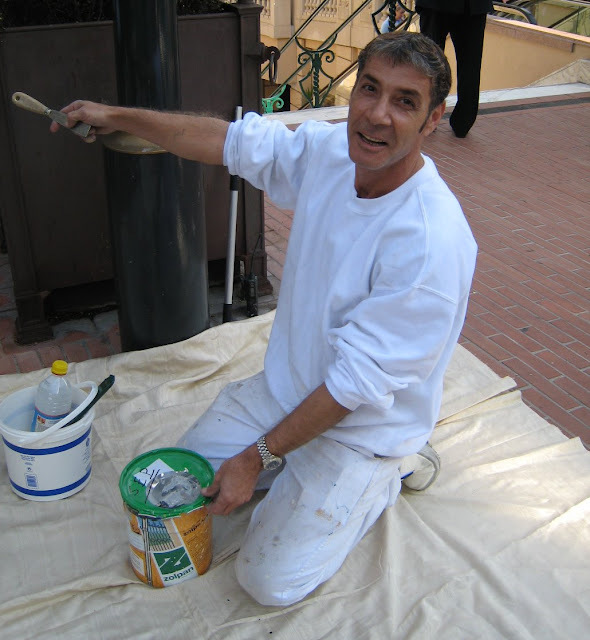 His sister, Princess Stephanie, is President of Fight AIDS Monaco. 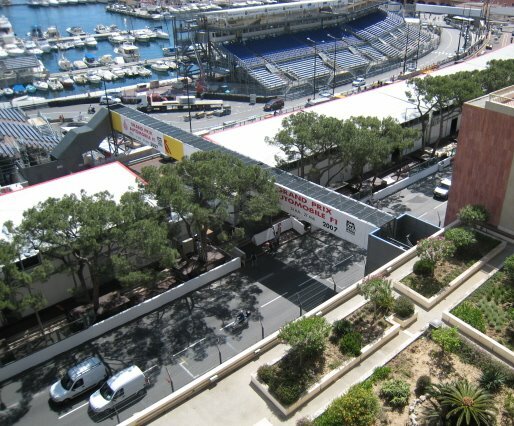 A temporary bridge but an iconic one for Monte Carlo at Grand Prix time. This bridge gives access to those holding tickets for stands in the port area. Anyone who has watched the Monaco Grand Prix, here or on television, will know this bridge is right by the Start/Finish line. 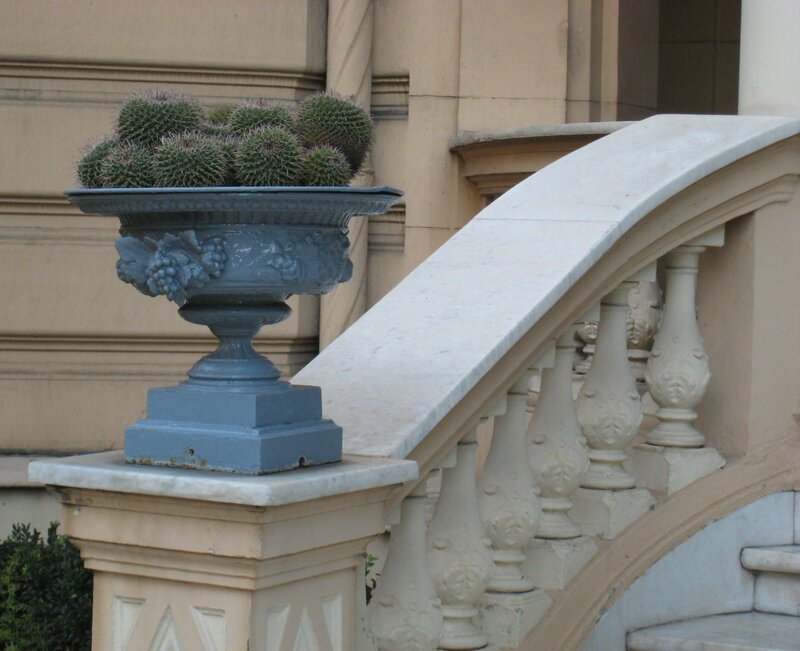 A pot of spikey cactus at the entrance to a beautiful house adjacent to Casino Square. 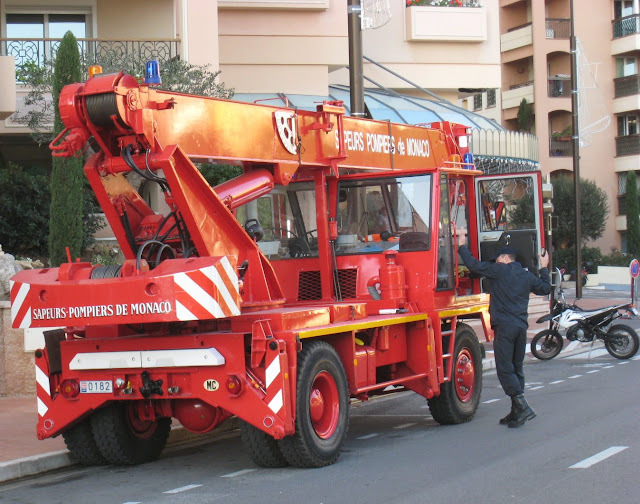 Not a usual sight in the Principality of Monaco. The streets are normally pristine. 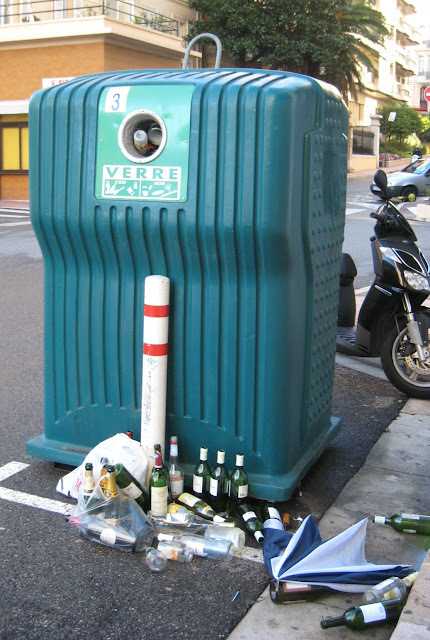 Obviously the local residents had a 'very big party' or the company who empties these containers, didn't. This was taken in a small street just off the main port. And is that a small umbrella amongst the discarded bottles? 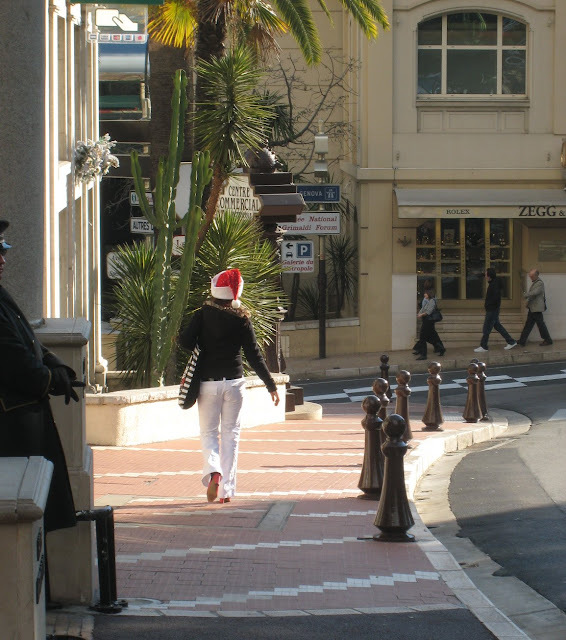 This Monte Carlo lady is walking towards the gardens that are just below the Casino. 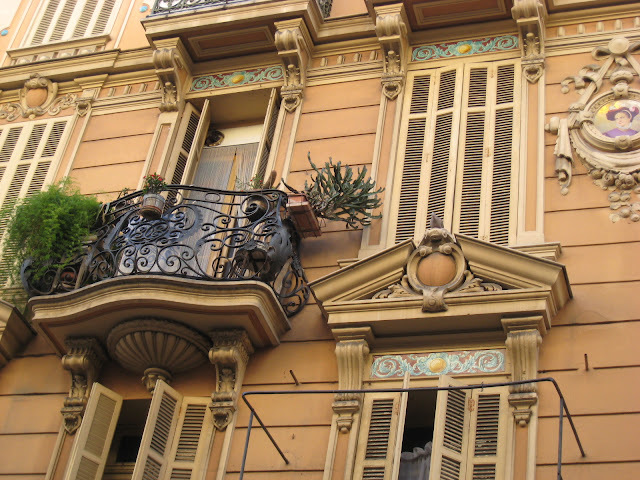 Part of the façade of a building - perhaps in need of a clean-up - just around the corner from the market. The market is in the Places des Armes. You can see a photograph of this beautiful square by clicking on the link. 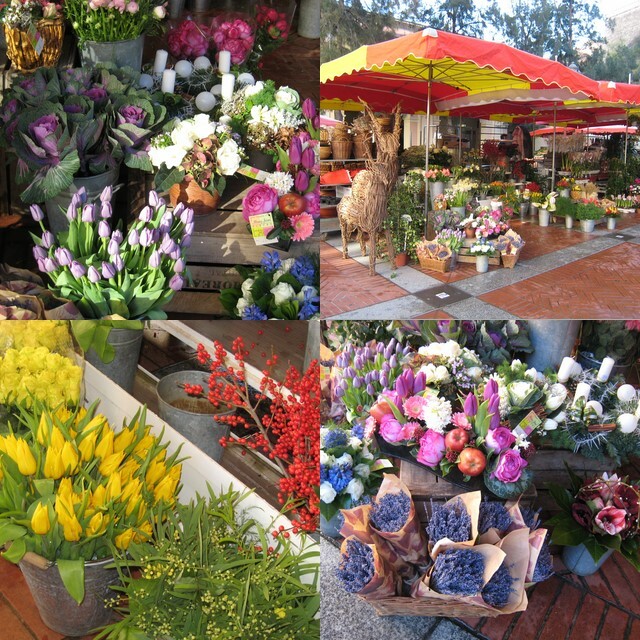 It's situated below Le Rocher (where you'll find the palace) - you can just glimpse Le Rocher behind the flower stall. Monte Carlo market. 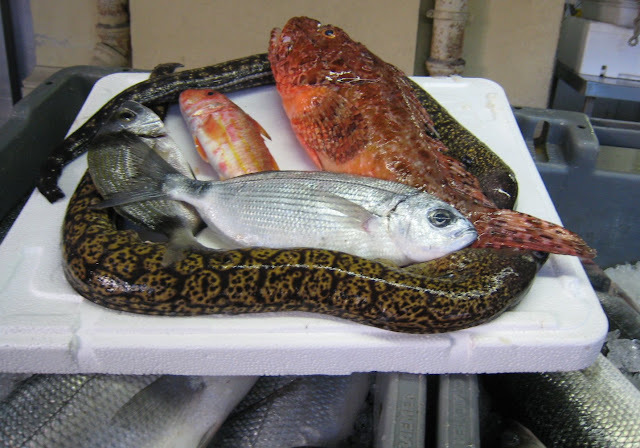 I stopped to buy a fish for dinner and asked the fishmonger the name of the eel-like creature with the decorative skin - and if I could take a photo. A few minutes later, he was arranging his best fish on this white board for me to photograph. He explained that his brother is the fisherman and he sells the fish and a few minutes later, I found myself with an invitation to go out on the boat one day to take photographs! I just love people who take such obvious pride in what their sell or what they do. You can see the care he is taking to artistically arrange the fish for me to photograph. What a guy! The eel-like fish is called murene (moray eel) which he explained is a carnivorous fish - a type of conger eel - but one with really vicious teeth. The ancient Romans bred this fish and used to satisfy its voracious appetite by feeding it a wicked slave or two. 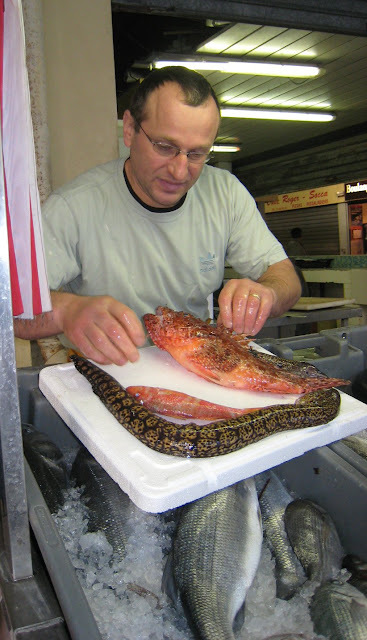 The big red fish is called chapon - another name for rascasse, which is the scorpion fish or hog-fish, much prized in the making of Bouillabaise, as is the eel. The smaller red fish is a rouget (red mullet) . I snapped this man up a ladder outside the Metropole Centre (see below) and thought he'd not noticed me, but when I walked past him later, he called out - 'Hey, take a photo of me smiling then!' - so I did. Has this sort of thing ever happened to you? When Prince Charles III decided to create Monte-Carlo in 1866, this area of the Principality was nothing but a huge plateau sloping gently towards the sea from the top of Monte Agel. At that time a sparse population lived in the few villas and houses scattered over the olive groves and scrubland. The only chapel that existed on the plateau of Monte-Carlo was Saint Laurent's chapel which was an ordinary private oratory, so any religious services had to take place in Saint Nicolas' on Le Rocher - Monaco's only parish church. 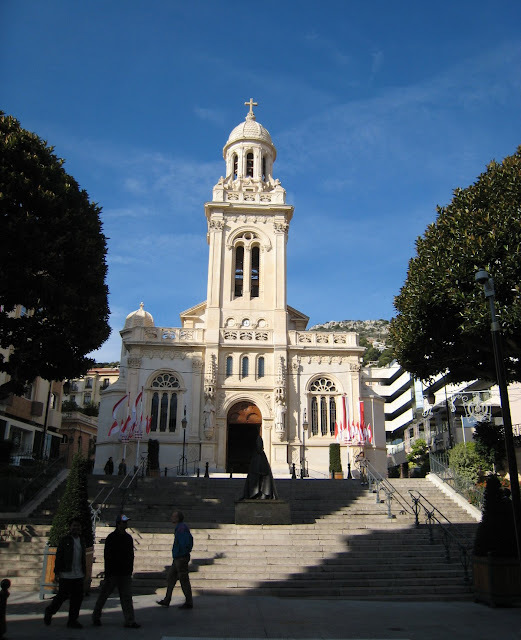 Prince Charles III had already anticipated the rapid growth of Monte Carlo due to the Casino and the rapid rise in the population and between 1879 and 1883 he built this church, replacing Saint Laurent's chapel, and naming it after Saint Charles Borromeo, his patron saint. In shadow and half way up the steps is a modern sculpture of Cardinal Seduto, which I'll show you another time. This photograph was taken from the Boulevard de Moulins, from which you can gain access to the church. We've dined, we cross the square and walk past the brightly lit Casino on our way to the carpark. 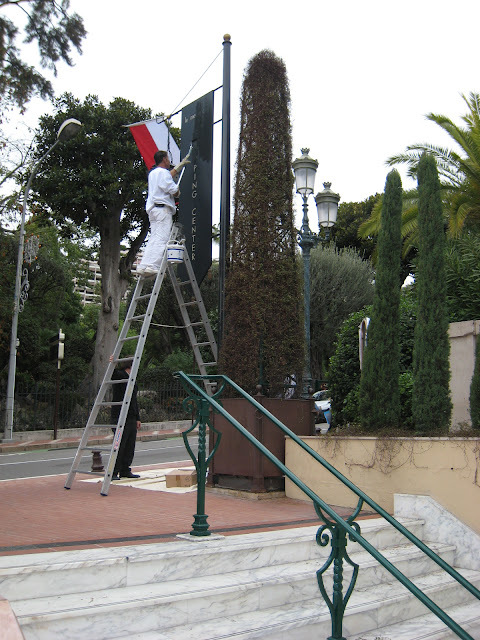 The red and white flags, by the way, are to celebrate Monaco's National Day. 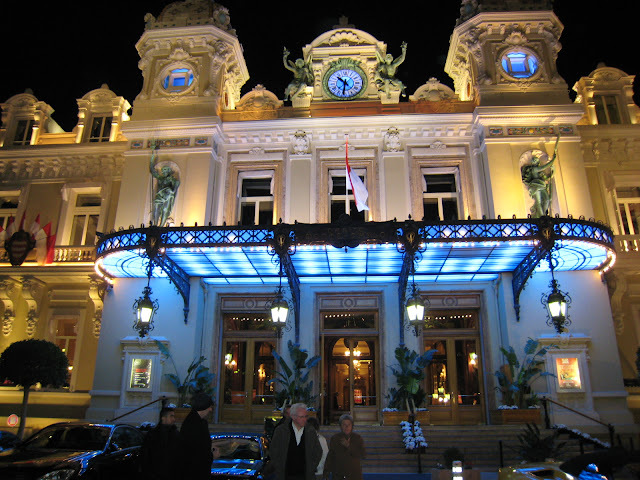 Another 'Night out in Monte Carlo' might include a visit to the Casino, perhaps we'd go to Jimmy'z, the famous nightclub - or to The Living Room, a piano bar where we can dance. Monte Carlo isn't short on nightlife. 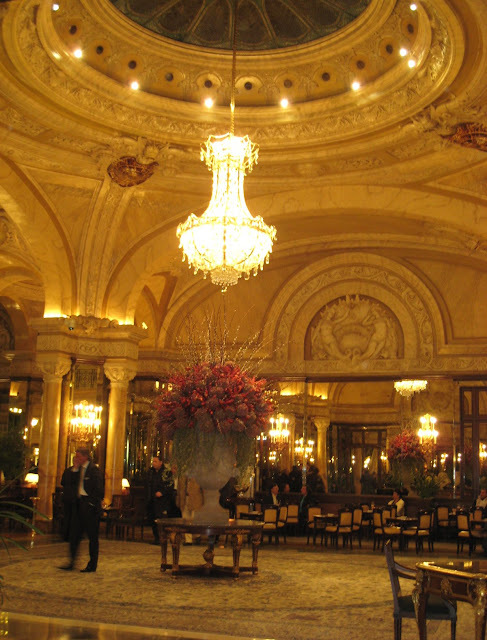 When you visit the Casino you have to show your passport - which will then be photocopied - and you have to hand in your camera before entering this magnificent Belle Epoque building, designed by Charles Garnier, who designed the Paris Opera House. (Do click on the link) There is a charge for entering but it's well worth it to see the splendours within. 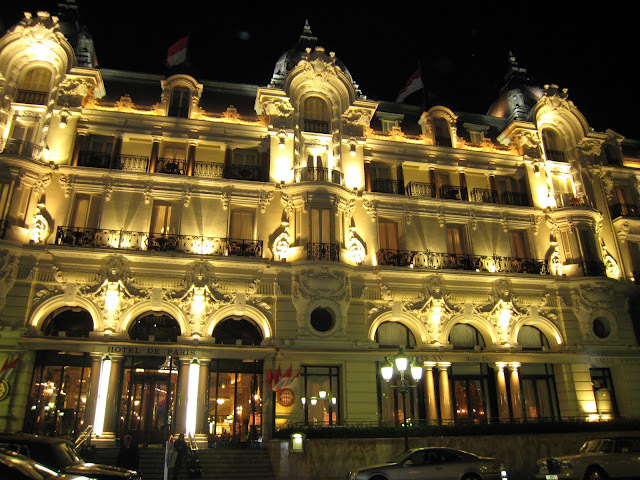 Monaco citizens, called Monegasques - are not permitted to enter the casino. 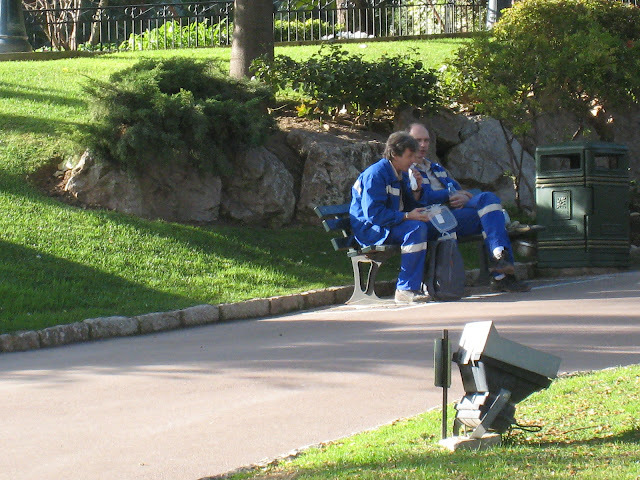 Monaco residents (there is a difference) are. This is the last day of our Night out in Monte Carlo, but I know it won't be the last time we visit this part of Monte Carlo. Thanks so much for sharing the evening. I enjoyed your company. And happy Thanksgiving to all who are celebrating today. 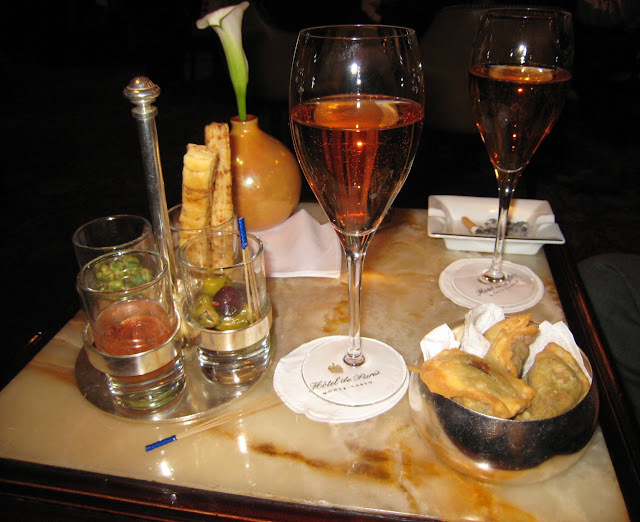 So after champagne in the American Bar of the Hôtel de Paris, we ladies need to go to the loo. Don't worry I'm not going to show you an actual lavatory but here's a corner of the Ladies' Room which I think is quite smart. Actually the most beautiful Ladies Room in Monaco is in the Hôtel Hermitage where they have antique painted porcelain toilet bowls and washbasins. I did hear recently that these had been replaced. I hope not. You see the sort of things we discuss in Monaco! 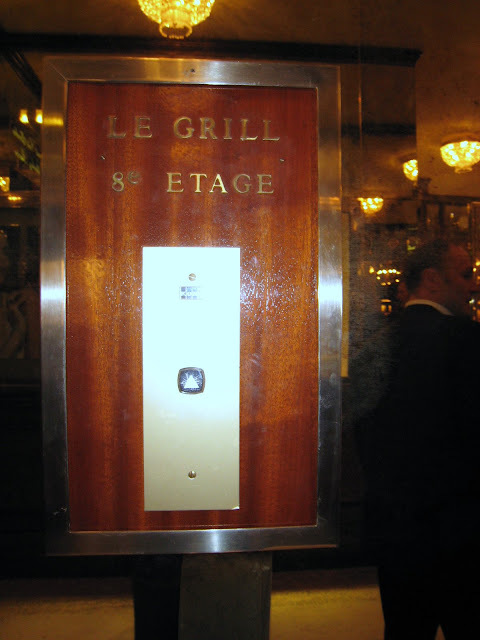 We've walked up the steps of the Hôtel de Paris, passed through the revolving doors, been greeted by one of the Lagerfeld-dressed doormen, of course. 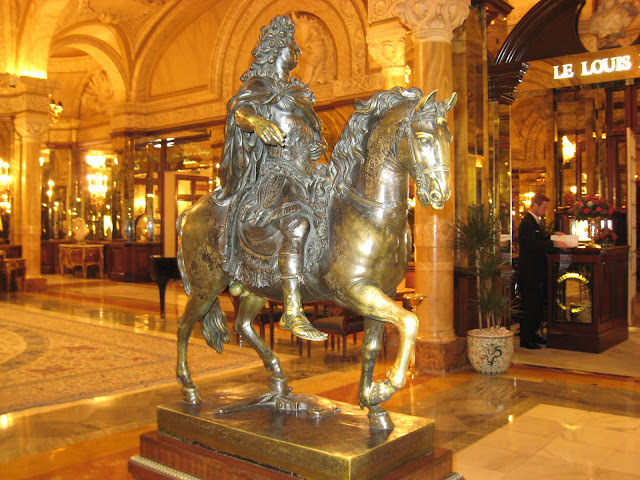 Just inside the lobby of this magnificent Belle Epoque building is a statue of Louis XIV on horseback. You can see the patina on the horse's knee, where it's been rubbed - for luck - by countless gamblers over the years. The casino is just a few steps away across Casino square. Alain Ducasse's famous Michelin three-starred Le Louis XV restaurant is off to the right. You can just see the entrance in this photograph. It has a wine cellar with reputedly millions of dollars worth of century-old Napoleon brandy and Chateau Margaux 1920. No, I'm sorry, we are not eating there but do click on the link - you can do a virtual tour of the restaurant - and as you'll see it's absolutely stunning. You do need to mortgage your house to eat there tho. 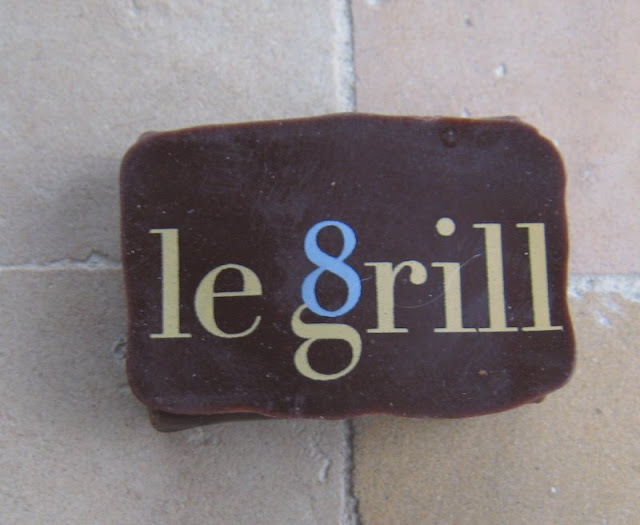 To the left, out of shot, is the American Bar - that is where we'll be going for a drink before eating in Le Grill upstairs.